Kairavini karaiyinile - திரு அல்லிக்கேணி குளக்கரையோரம்: NGT fatwa on chanting mantras, ringing of bells at holy Amarnath !! NGT fatwa on chanting mantras, ringing of bells at holy Amarnath !! Thondaradipodigal advises humanity on the greatness of chanting the name of SrimanNarayana. To those caught in the quagmire of sin, he shows the example of Kathirabandu, who was the epitome of evil, but was saved because he changed ‘Govindanamasankeerthanam’. The name ‘Govinda’ is the remedy for all sins that we commit on earth. Govinda, is Lord Krishna who tendered cows; it is He who gives the power of speech; He who provided Indra, Vajrayudham from Dadichi’s backbone; Saviour of earth. It is His name that we must utter before we eat and do anything worthy. For the devout, going to temples, doing kainkaryam to Him and to His bagavathas, chanting loudly without fear - His thousand names, conducting special prayers, chanting arulicheyal and vedas. Worship Him in all sincerity – sure we will get, wealth, good health and peace of mind, leading a contended life leading to His immortal abode. In the Himalayas lies the great shrine of Vaishnodevi in Katra area of Jammu – it is witnessing severe snowfall coupled with cold winds and rains. The snowfall has affected the flow of pilgrims on the stretch. Earlier today, due to bad weather and fog around Trikuta hills, helicopter services were suspended for the second day in a row to the shrine. These places are snow-laden while the maximum temperature plummeting by 4-6 degrees Celsius at most places due to light to moderate rains adding to the chill. Amarnath cave housing the holy linga is located in Jammu and Kashmir, situated at an altitude of 3,888 m (12,756 ft), about 141 km (88 mi) from Srinagar and reached through Pahalgam town. In the snowy mountains, the cave is covered with snow most of the year except for a short period of time in summer when it is open to devotees. 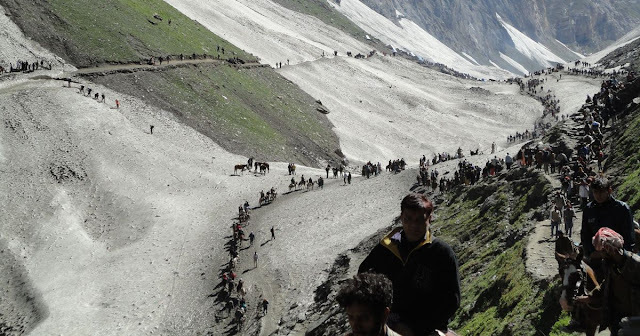 Hundreds of thousands of devotees make an annual pilgrimage to the Amarnath cave on challenging mountainous terrain to have darshanof ice stalagmite – the holy linga. National Green Tribunal was established under the National Green Tribunal Act 2010 for effective and expeditious disposal of cases relating to environmental protection and conservation of forests and other natural resources including enforcement of any legal right relating to environment and giving relief and compensation for damages to persons and property and for matters connected therewith or incidental thereto. The purpose of the Tribunal is reported to be not bound by the procedure laid down under the Code of Civil Procedure, 1908, but guided by principles of natural justice. They are in news for making us sad with their directive. All frontline media reported that National Green Tribunal on Wednesday directed the Amarnath shrine board that there should be no chanting of 'mantras' or 'jaykaras' , no ringing of bells in the shrine... The green panel also directed that from the last check post there should be single line of people walking towards the cave. The NGT had earlier asked the committee to consider declaring the area around the Amarnath Shrine cave as "silence zone" to prevent avalanches and ensure there is prohibition on carrying of religious offerings inside the cave to maintain its pristine nature. Whilst the motive and purpose behind setting up of this Tribunal could be saving environ, how could they be considered right in interfering with our religious way of life – how could they ban chanting mantras, ringing bells at Amarnath temple. Not only this, it has also asked the pilgrims not to carry mobile phones and personal belongings after the last check post. This certainly looks going over board and overtly prejudicial – for can they imagine doing a miniscule part of this to any other religious congregation ?, then why this abject partiality ?!? The devotees naturally felt dejected and Vishwa Hindu Parishad described the new rules as “Tughlaki fatwa” taking a jibe at the court by stating that Hindus were not responsible for every ecological problem on earth ! In the aftermath of wide protests, NGT today issued a clarification about its new rules restricting the chanting of mantras or the ringing of bells inside the Amarnath cave, ANI reported. The temple has not been declared a “silent zone” and the new rules do not impose any restrictions during the aarti and other rituals, a statement by the tribunal said. The green tribunal, clarified that it only wants devotees to maintain silence in front of Shivlinga ! (again why a Tribunal try to regulate how a prayer be conducted ? ]; the restriction is not applicable in other places. Ringing of bells, chanting 'Bam BamBhole' in Amarnath; regulation on food offerings and coconuts near and inside the cave – are these within the purview of any Tribunal; and .. .. and .. would it be so for all religions. Devotees have to ponder !